We found out that she is wearing the Joie Lace Up Wedge w/Fringe. Nicki has on the Multi Print on Cream style. I love the graphic print on them in the rainbow of colors - very different. 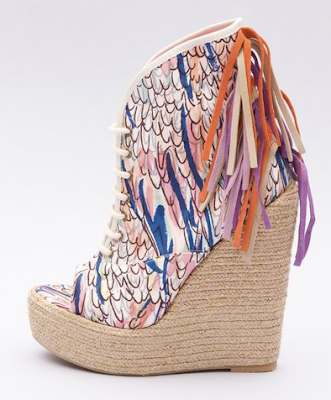 The espadrille style wedge is hot again this season (so is the lace-up), and the platform makes them more comfortable on the feet. Get these now at Opening Ceremony for $540.